An ideal home for 4-5 families with children or 14 adults max. Or if you have a larger group, we have 3 houses, all right next door to each other! (See VRBO listings # 1402 and 471914). You’ll find everything you’re looking for and more in this beautiful upscale home right across the street from the beach! Our recently-built, custom home features inviting living areas on all three levels, a professionally designed kitchen that is open to a large dining and living area, and a private pool that’s perfect for large groups. You’ll appreciate the 5 master bedrooms (3 kings, 2 queens), a double bunk room with 2 full-over-full bunks (yes, that’s 4 full beds) and a set of built-in twin bunks (2 twin beds), as well as 5 custom bathrooms. To “top” it all off, there is a 4th-floor observation deck with incredible 360-degree panoramic views – it’s the highest deck in Crystal Beach! This home also comes with a 4-passenger golf cart, so you can conveniently cruise Scenic 98! We keep our home clean and well updated and pay attention to amenities you expect, such as the high-speed internet (free wifi), nice flat-screen TVs, high-definition cable, big, fluffy bath towels and hair dryers in each bathroom, and more. We also provide items our smaller guests may need like a high chair and pack-n-play. This level features a great recreation room with a poker/game table with chairs - flip it over, and it’s a bumper pool table! It’s a fun place to hang out with plenty of comfortable seating and an HDTV with a Blue Ray DVD Player. The bar area has a sink, 4 bar stools and a full-size refrigerator with ice-maker, which is very convenient for outdoor dining as well since this room opens onto the amazing private pool. The huge open family room is the heart of the home - there’s plenty of space for your entire group to gather here! You can relax in the huge comfortable sectional in the living area and maybe enjoy a game or movie on the large flat-screen TV. There are expansive windows for great light and French doors lead onto one of the three roomy balconies. This lovely private room features a KING BED with luxurious linens and beautiful hardwood floors. There’s a bedside table with a lamp, a dresser, and a nice flat-screen TV. You’ll also appreciate the incredible attached private bathroom. This bedroom has a KING BED with a bedside table and lamp for reading. There’s also a wall-mounted TV, a dresser, a nice closet, and an attached full bathroom. Enter this beautiful bathroom from the King Master and from the hallway. It features a beautiful glass tile shower, freestanding vanity, and a commode. This spacious master suite has a comfortable KING BED, bedside tables, lamps, and a dresser. The floor is beautiful hardwood and you’ll appreciate the huge walk-in closet. There’s a separate seating area with a sleeper sofa and chaise with a large, flat-screen TV, and of course, there’s a luxurious attached bathroom. This exclusive bathroom for King Master guests has an extra-large granite vanity, two sinks, and a beautiful walk-in tile shower. There’s also a private commode. Here’s another great living area in this home. It features tile floors, a queen sleeper sofa, and two comfortable chairs. There’s a large, mounted TV and a Play Station too. Step out onto a great balcony – and from there, take the stairs up to the 4th FLOOR OBSERVATION DECK – with incredible 360-degree panoramic views - it’s the highest deck in Crystal Beach! You’ll find 4 lounge chairs, a long bench and beautiful wrought iron railings. Two full-over-full bunk beds (yes, that’s 4 double beds) sleep up to 8 children. This room features wood floors, a flat-screen TV, a dresser, and a nice double closet. This bathroom includes a large tile vanity with 2 sinks, commode, and beautiful tile tub/shower combination. We know how difficult it is to find a vacation rental to suit your family’s needs, schedules and budget. We’re happy to assist you with the process of finding and booking the right place to stay for your vacation. We don’t leave you hanging—we actually answer our phone and do our best to get back to all email inquiries within an hour (and if you put your phone number into the inquiry form, we will call you)! We keep our calendars up-to-date and if this property is booked, be sure to check our other properties by pressing the “All My Rental Listings” link above the Photos section of this page. GOLF CART –Use of a golf cart is included for bookings made after Nov. 10, 2018. 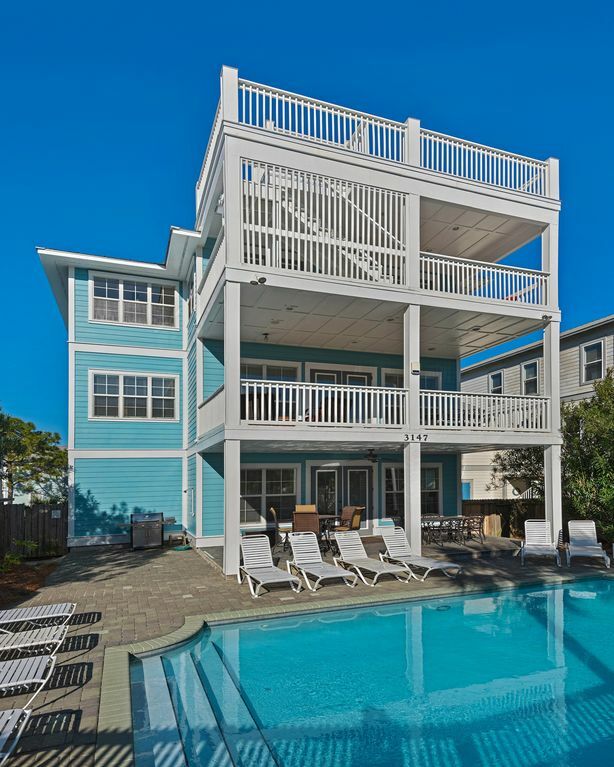 We are the proud new owners of 'Over the Top' in Destin's Crystal Beach. We are excited to offer this amazing beach home, and know your family will appreciate all the features of this home. No one knows the 'by owner' vacation rental business better than we do. We are fortunate to have been part of VRBO since its earliest days, and are honored to host you in any of our several vacation homes. After being regular visitors to Destin for more than two decades, we decided we wanted to invest in above-average homes, and keep them in top shape. These are not 'just rentals' that we minimally maintain. We live in Destin now, and greet all our guests, so we want to be proud of these homes. All of Destin's beaches are just amazing, but the Crystal Beach community is lower-density than other areas in Destin - no high-rise condos. It feels more like a quaint neighborhood with its white picket fences and sidewalks rather than a loud, busy resort. 4 floors of exterior decks, outstanding 4th floor observation deck. Outstanding private pool. Gulf front beach is directly across the street. White sand beaches, you just can't beat them! Crystal clear Emerald water. World class dining, shopping, fishing, and golfing! Ocean View : Great gulf views, 4th floor observation deck, beach access right across the street! Dining table seats 8 with room for 8 more at the kitchen counter. Poker/game table and chairs in 1st floor recreation room. (4) : 4 levels of balconies. 3 are covered, the 4th is an amazing outdoor 4th story observation deck with exceptional views! This pool can be heated for a fee!